The Volunteer Enlistment document contained many interesting items. In the first sentence, I learned things that I had not previously known: he was born in Ellery, New York (in Chatauqua County) and when he enlisted on 3 September 1864, he was a 42 year-old carpenter. The handwriting through most of that document was consistent with the signature of the enlistment office, Captain Geo. 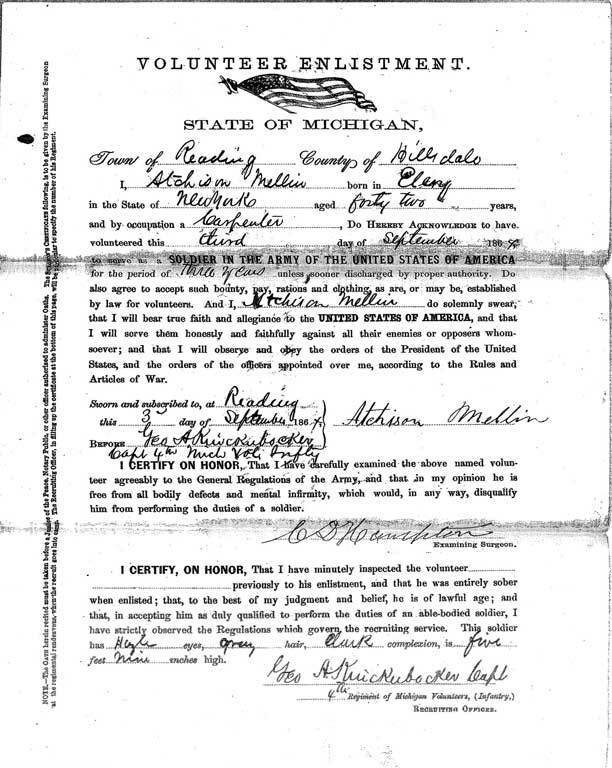 A. Knickerbocker, of the Fourth Michigan Volunteer Infantry, however, on the signature line there was a clearly different signature….that of Atchison Mellin, himself. The final sentence was equally as important; it gave a brief physical description of my unseen ancestor. He was my height, standing 5 feet 9 inches tall, had a dark complexion with grey hair and hazel-colored eyes. This sworn document gave me valuable clues in tracing the Mellin family back in history! The packet of papers also revealed that Mellin was sworn into service in Adrian, Michigan on September 9, 1864, assigned to Company F. He was paid a bounty of $100 and another $200 was due. One year into his three-year enlistment, a letter was written on his behalf to the Assistant Adjutant General, William H. Sinclair, of the Central District Texas. The letter, written by Captain W.C. Edgar of Company Y on October 3, 1865, states that he had “…received intelligence of the protracted sickness of his [Atchison Mellin] wife and child and it not being expected that his wife will recover…” A sixty-day furlough was granted two days later and Mellin boarded a stage from San Antonio to Indianola to begin his journey back to southern Michigan. He was later required to reimburse the U.S. Army $20 for that coach ride. 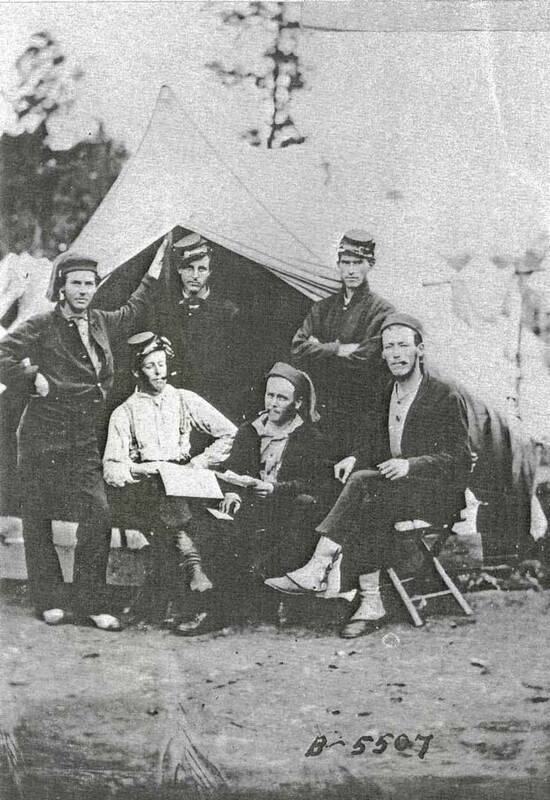 The company commander reported the unit’s condition at the time of Mellin’s request for leave in early October 1865. One officer was on duty and two were sick. There were 73 men in the company, of which only 32 enlisted men were available for duty. Thirty-one men were absent with sickness, while three sick men were still on site. Two men were in confinement and one was away without leave. Those figures sound rather bleak to me. The demands on the soldiers must have been quite low at the time to allow someone to leave for two months! The Company Muster Roll for January and February 1866, indicated that Private Mellin was “absent with leave since Oct. 20, 1865.” Clearly, he was away for much longer than the sixty days noted in his military file! The official documents did not indicate where he was posted during his service. The actions of the 4th Michigan were much easier to acquire than Mellin’s military service records! The unit was comprised of about 1000 men who lived in the Adrian/Hudson areas of southeast Michigan. They left Adrian on October 22 and arrived in Nashville, Tennessee three days later. The men moved on to Decatur, Alabama were they were engaged in battle with Confederate troops, October 26-29. The 4th Michigan then moved on to Whitesboro, Alabama where they were based for the next 4 to 5 weeks. In late November, they engaged the enemy in New Market and in early December, they were engaged further north, in the Third Battle of Murfreesboro, Tennessee. They remained stationed there over the Christmas holiday, guarding supply trains. The unit remained in the State of Tennessee through the winter and spring of 1866, when in June, they were transported down to New Orleans. There, the men boarded a steamboat for Indianola, Texas, arriving in early July. In the hot and humid weather of mid-July, the soldiers marched 170 miles to camp at Salada Creek, near San Antonio. It was from that location that Mellin was furloughed home to Michigan in early October. On April 9, 1866, Mellin reported to Detroit for transport back to his unit. On the following day, he was discharged from his infantry. One month later, the unit was ordered to return to Michigan. The men were mustered out of service in Houston, on the 26th of May. They marched to Galveston where they boarded a steamer to New Orleans, then on to Cairo, Illinois. A train took the soldiers back to Detroit, arriving on June 10. Oh! One final note concerning Mellin’s furlough to visit his gravely ill wife and child. At this time, I have not yet discovered all of the details but I do know that his wife, Livonia Miegs out-lived him by nearly twenty years and their son, Frank lived another forty years…and became my great grandfather. Hmmmm…. So much vital information concerning my great-great grandfather found in his military service file, thanks to the National Archives in Washington, D.C..
1. Military, Compiled Service Records. Civil War. Carded Records, Volunteer Organizations. Records of the Adjutant General’s Office, 1780s–1917, Record Group 94. National Archives, Washington, D.C.
2. “Tent No.8, Co.F, 4th Infantry.” Portrait. 30 Aug 1921. The Mathew B. Brady Collection of Civil War Photographs. National Archives, College Park, Maryland, USA.